Lu and I were driving home this afternoon, in sudden warm sunlight. She had been at her two-afternoons-a-week daycare (“..coool!” she calls it), where she splashed in water and sat on a tricycle and longed to be able to pedal. Afterwards, we stopped at Danny’s restaurant, where Lu ran to her daddy on the line, ate a corn fritter, got an apple from the kitchen manager, flirted with all of the boys, and waved to everyone else. It was a full afternoon. We were close to home, on that curve of a road we know so well now. She and I were talking about her day, in between verses of “Sing” from Sesame Street. (It’s her first song. She looks at me about 52 times a day and says, “La la?” She claps my hands for me and makes me sing. She joins in with all the nouns, in tune.) The sunlight was clear and dinner was waiting for us at home. “What did you say, hon?” I asked her. “Farm stand,” she said, pointing. And that it was. We were passing the farm stand we visit at least three times a week. Through the winter, we buy celery root and parsnips and hope for spring. This time of year, we just go for the tomatoes. She had never said that phrase before. Danny and I love that our kid knows the phrase farm stand and she can point it out on the way home in the car. We love that she knows the taste of heirloom tomatoes, bursting at the vine with ripeness. This time of year, ripe tomatoes are about all we need. So now its your turn: Have a recipe or tip that fits any of our weekly themes? Starting with our posts of Wednesday, July 28, for five Wednesdays, you can contribute in various ways, big or small. The cross-blog event idea works best when you leave your recipe or favorite links (whether to your own blog or someone elses) at all the host blogs. Yes, copy and paste them everywhere! That way, they are likely to be seen by the widest audience. Everyone benefits, and some pretty great dialog starts simmering. Or think bigger: Publish entire posts of your own, if you wish, and grab the juicy Summer Fest 2010 tomato badge (illustrated by Matt of Matt Bites). My friend Ashley is hugely pregnant, in that awkward place where she just wants that baby girl to arrive, already. Most of us in that state? We’re lying on the couch with a cold glass of water, a box of chocolates, and a tv remote in our hands. Ashley? She decided to enter a cooking contest at the Queen Anne Farmers’ Market, which called for tomatoes. And of course, because she’s Ashley, she won. That baby girl has one cool mama. Her heirloom tomato tart looked stunning. Because I know Ashley, I know it also tasted fantastic. I couldn’t eat it, but I could try to make it. Ashley was kind enough to send me her recipe. Late this morning, we all set to work to make this: I made the crust in the food processor, Danny combined the goat cheese and basil then sliced the tomatoes, and Lu ate as many tomatoes as she could. This was the best lunch of the summer. Make it, if you have great tomatoes on hand. Making the tart dough. Combine the salt, AP flour, almond flour, guar gum, butter, and romano cheese in a food processor. Pulse, briefly, until the butter pieces are roughly the size of peas. Add the first tablespoon of ice water and pulse. If the dough feels dry, add the second tablespoon. Do not add too much water. You don’t want a wet dough. The dough should merely stick together when you pinch it between your fingers. Tumble the dart dough out onto your tart shell. (We use a rectangular one like this one .) Press it into the pan with your fingers. Press all along the bottom, then push the dough up the sides of the pan. Make the dough uniform thickness. Chill it in the freezer for at least 15 minutes. Baking the tart. While the tart shell is chilling, preheat the oven to 375°. Prick the bottom of the tart shell with a fork, to prevent it from bubbling up. Bake for 15 minutes, then check to see if any part is puffing up. If so, use that fork again. Bake until the tart shell is brown and firm, about 10 more minutes. Pull the tart shell out of the oven and allow it to cool. Finishing the tart. Mix the chevre and basil together, then spread it evenly over the bottom of the tart shell. Arrange the tomato slices over the chevre. Drizzle with olive oil and sprinkle with sea salt. 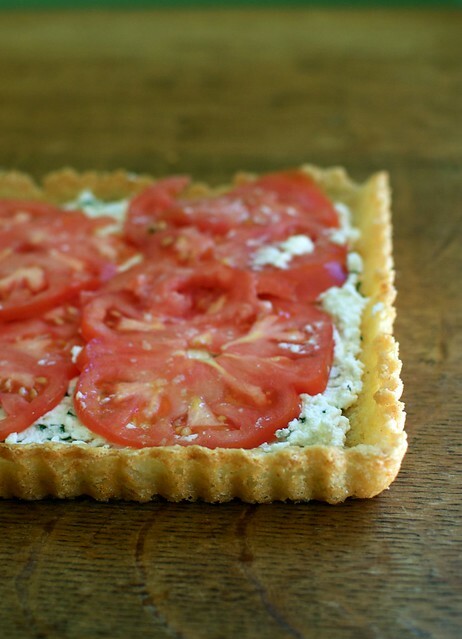 I have been seeing so many tomato tart recipes lately – I have got to try one! The goat cheese sounds like a great pairing with the tomatoes. This looks so wonderful – all of my favorite flavors and ingredients, YUM! Thank you! Beautiful toms. Love your recipe. Living in Italy for the past two years, I really gained a new appreciation of perfectly ripe tomatoes. Here are a few of my favorite ways to eat themstraight from my blog, Flexitarian Foodie! There are plenty more tomato recipes on Flexitarian Foodie, come take a look! Lovely post and your photographs are always to die for! Looks so delicious! Can't wait to make. I have had a tart pan just waiting for this. What is the Ahern AP flour recipe? I love your story! And I love a good tomato tart. This has a parmesan cheese crust? Genius! Plus, my most recent dish, Quinoa Tabouli, in which ripe summer tomatoes are essential! M just said "farmers market" last Saturday! Coincidence? I think not. Happy food-talk to your household, too. That looks delicious! That is the second tomato tart recipe I've seen this week, the first being at the Holy Tomato event at the Queen Anne Farmer's Market we have a stall in. This one I'll be able to eat! Great for all those freshly ripening tomatoes! I love that you're bringing up your (ever so cute) daughter to appreciate and enjoy food. To hear the words "farm stand" out of her mouth must have brought such a moment of joy for you! 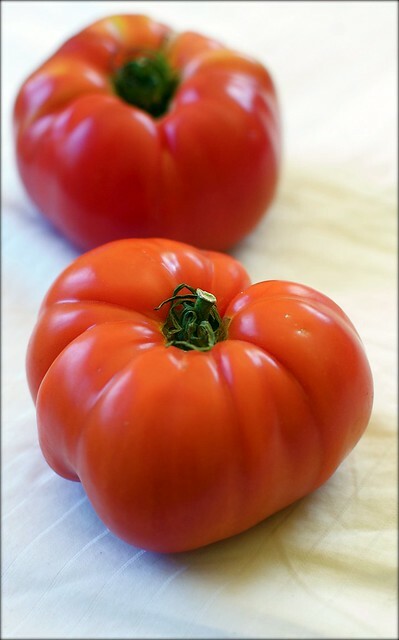 In the upcoming days Ill have Ina Gartens Scalloped Tomatoes, Paula Deens Tomato Pie and my own take on Caprese Salad. I sure have enjoyed playing along with all the Summer Fest 2010 participants. I also learned a lot of useful info for my garden next summer. Thank you Margaret for creating this event! That is just gorgeous. I am def. trying your crust and I just love the Ahern's flour- hope you'll be marketing it! Mmmm….that looks delicous. I don't need to worry about gluten but that's not going to stop me from making this yummy tart :). I like the part where Lu says "farm stand" – and I crave the tart. One of my fall plans is to make up a batch of Ahern AP Flour and get ready to bake again. Thank you! I am always on the lookout for more gluten-free tart dough recipes — thank you! My contribution to Summer Fest this week is a cheesy tomato and zucchini gratin, bubbling out of the oven, just waiting to be eaten for dinner . . . With a gluten-free option, of course. thanks. i have been reading your blog for a while. and now i am reading your book. want to say … both about blog and about book, i like that you appreciate all the you have. husband, child, food, travel …. so many people in your situation would have flipped over to an arrogant position and forgot about all of us "little people." you are a really good and deep feeling person. i am happy you learned you were gluten free and i am happy they you have had success. Lovely shauna! I don't think I even need a crust– you had me with the tomatoes with the goat cheese! Love any cheese with any tomato combo!!! This year I ventured out and planted a Greek variety called "Thessaloniki" a small but juicy tomato, which I purchased at Quail gardens in Encinitas during their "TomatoMania" festival. My recipe is a Greek family egg scramble my mother would make us during the summer time for dinner. These tomato tarts sound amazing. I use almond flour often for sweets and savories – love the texture and flavor. I can't wait to try this recipe! I just bought some fresh heirloom tomatoes at my local farmer's market. What a great way to use them. Thank you! That was WONDERFUL! I made it for a boat-ride, and all were pleased. We did find the crust a tad salty. OF course, it could be because I was short on goat cheese? I'll be buying another container of fresh goat cheese this week at the farmer's market and will make the tart *before* I eat half of it this time 🙂 Perhaps will cut back a drop on the salt, and will be sure to do 2 layers of tomatoes. Beautiful recipe and reflections on Sesame Street. I live in Vermont, though, so I think I'll make it with cheddar… But WOW, the tomatoes this week finally! Just made these for lunch, only using six small tart pans–which worked out perfectly for the amount of dough. I too found the dough to be too salty–and I have NOTHING against salty, so that says something. Also, I found the cheese taste to be overwhelming in them as well. I think I will cut back the cheese by half next time and up the flours to find the right balance. I also found the bottoms to be quite greasy, so this should help as well. I feel like this is all negative, but the DH loved them as did I–just feel they need a tiny bit of tweeking. I LOVE this post! I am so sad that I found it after all the good tomatoes have gone for the season… Bookmarking for summer 😀 Thank you! !